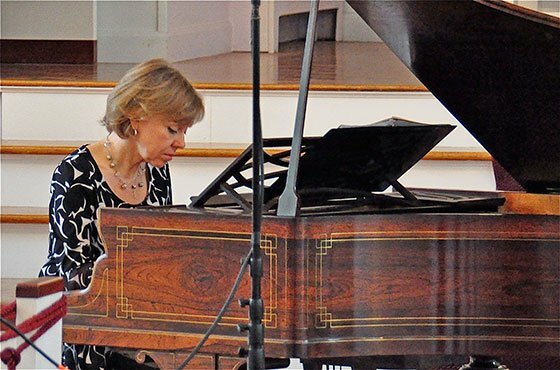 For her first appearance on the Frederick Collection’s final concert of its 29th Fall Season, Helsinki-born pianist Marja Kaisla chose an 1840 Érard for mostly Romantic music. Her appearance on Sunday was co-sponsored by the Finnish Center at Saima Park in Fitchburg; Kaisla recently received two awards for her work promoting Finnish and Finnish-American artists. The Érard is one of my favorites because of its intimate and restrained sound compared with later examples. The type, though, seems to attract fewer pianists performing in the series, perhaps because it is neither quite enough like a modern instrument nor different enough to draw them as earlier ones do. But it serves a variety of 19th-century music extremely well, as Kaisla demonstrated. She opened with Robert Schumann’s Kinderszenen, a set of 13 character pieces published in 1838, selected from the 31 he composed. Although the titles appear at the head of the scores, they were added after the music was written, so should not be considered a listing of their inspiration. Schumann’s piano was not an Érard, but was from the same period, and consequently the music fit it well and rendered it enchantingly because of the variety in tone among registers. Kaisla managed dynamics extremely well. She moved on from the general delicacy of the Schumann to Franz Liszt’s more powerful Sonetto 104 del Petrarca, written 1837-’46, inspired by the poem whose English translation Kaisla read prior to playing. This work too demands careful handling of the dynamics, but is more Romantic, and Kaisla’s and the Érard’s rendering were again highly successful. An unannounced piece showed yet more of what the instrument can do: Liszt’s 1881 Trübe Wolken (Gray Clouds), a short late work pointing the way toward Impressionism and 12-tone music. It uses the bass register heavily as well as the piano’s full dynamic range, and sounded impressive on this instrument even though pianos has made enormous advances in the intervening years. Liszt owned several makes of piano, including an Érard ordered in the mid-1830s.Unlike many pianist-composers, Liszt actually purchased many of his instruments rather than persuading makers to lend them to him. To change the mood, Kaisla added another unannounced piece to conclude the first half: Chopin’s Impromptu No. 1 in A-flat Major, Op. 29. Unlike Liszt, Chopin did not own an Érard, although he did often play them; he was close friends with Camille Pleyel, owner of the rival firm founded by his father, Ignaz, and favored its products. After the break, Kaisla played two Chopin Nocturnes and a group of nine Preludes, not announced individually. As an encore, and because of the large number of Finnish-Americans in the audience, she offered the Romance, Op. 24/9, by Jean Sibelius, demonstrating that even late 19th– and early 20th-century music composed on instruments with cast-iron frames can sound magical on predecessors. Before playing, Kaisla spoke about the composers, the works, the instrument, and the differences between it and a modern one for a pianist. This was her first encounter with an earlier piano, and she found some aspects revelatory: for example how metronome markings she had thought impossible to respect could be rendered on keys whose descent is much shallower, and how the variety across registers makes the music more nuanced. Other aspects, such as the shorter keyboard which did not have a low note Liszt called for, and the shorter keys themselves, were occasionally problematic. Many of her comments were interesting, but because she was speaking extemporaneously, she prolonged them and lost her train of thought, rendering some comments tedious enough to lose her listeners. Some escaped at intermission and others rose and left both between and in the middle of second-half pieces. Her going long also caused her not to play an apparently planned set of waltzes, per the program, as darkness was descending. Many of us wanted more of the superfine playing and less of the talking, especially given how the instrument suited the selections. The 1840, serial number 14731, is 8 feet, 10.5 inches long, has a range of 6 and 2/3 (originally 6.5) octaves, is parallel strung—triple in the upper registers, double in the upper eight bass notes, and overspun single in the lowest six notes on a separate bridge—and has five iron tension bars, a metal hitchplate and other metal parts mounted on a wooden frame (Érard never built cross- or overstrung pianos with cast iron frames like Steinway always has). Its especially attractive and elegant case is rosewood with a brass line inlay, and the maker’s nameplate on the fallboard is particularly elaborate and ornate. It was modified by the maker in 1860, with two notes added on the upper end of the keyboard, “updating” it to play and sound like the firm’s instruments made at that time. It has two pedals, una corda and damper, on the maker’s signature lyre-shaped lyre. You can read about the Érard company’s 200 years of piano making at the end of my review of the recital on the Collection’s 1877 Érard extra-grand modèle de concert here.